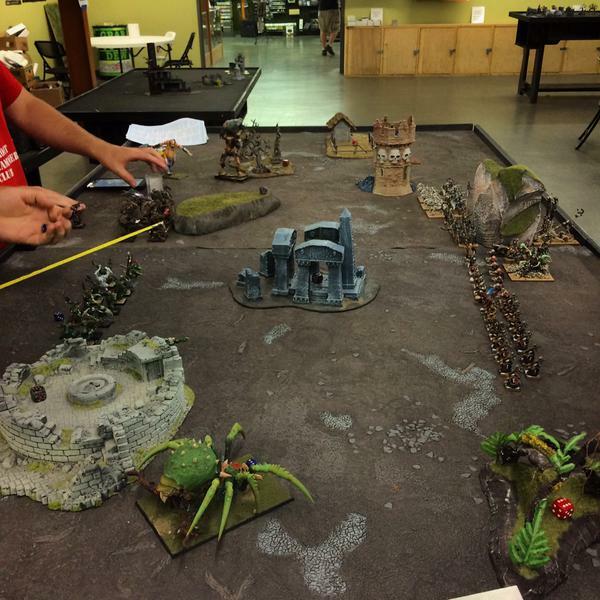 The other week I finally got in my first game of Age of Sigmar. A new gaming system is always intimidating to learn, but I have to say, I found it to be a lot of fun! For the first time in my hobby life I am on a level playing field with everyone else. I came into 40k during 3rd edition and Fantasy during 6th (didn't play much until 8th though), so there has always been a whole group of players who have a better understanding of the rules then me. 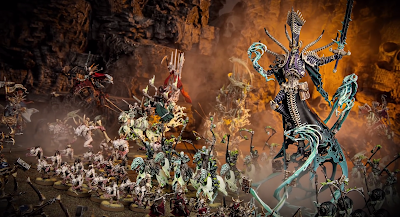 With Age of Sigmar everyone has been set back to zero, so I have just as much experience with it as everyone else. In fact, I almost feel like I am at slight advantage compared to my normal Fantasy opponents since I started out with 40k before moving into Fantasy. The skirmish level rules and new movement systems isn't nearly as alien to me as it is to them. I took my Tomb Kings with me and the only restrictions my friend and I had planned on was no unpainted models. I thought that was quite a good idea actually. In a game with basically no army building restrictions why not make that the only restriction. 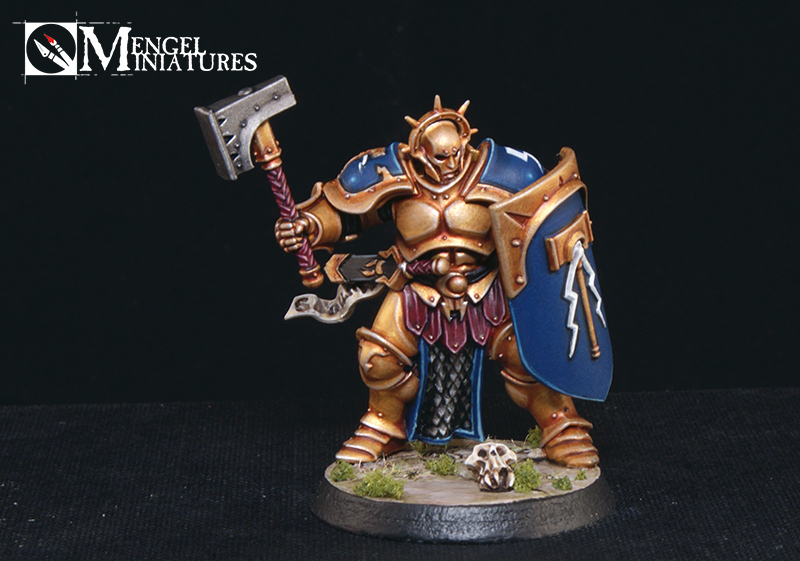 It will encourage people to actually paint their models and then rewards you for doing so. We ended up having two more players there as well so in the end we decided on playing a four person game, two people per team. The other players were less comfortable with the no restrictions thing so we ended up doing 50 wounds max, 0-2 heroes, and 0-2 monsters. In the end it worked out fine and probably would have made the game too long considering we had four people playing. In a one on one game though I would still recommend following the spirit of the rules and lift all restrictions. 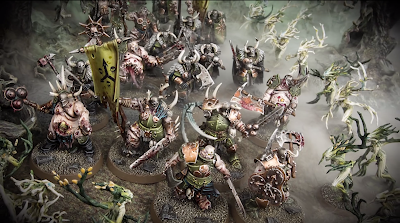 If you and your friend can't work out how to play a fun and engaging game and instead one of you ends up fielding as much stuff as you can to try and crush the other, well, then you should probably look to find a new gaming group. Our game was my Tomb Kings and my friends Duardin (Dwarfs) versus a team up of Orruks (Orcs) and Beastmen. We played a straight pitched battle scenario since we were all still new to it. 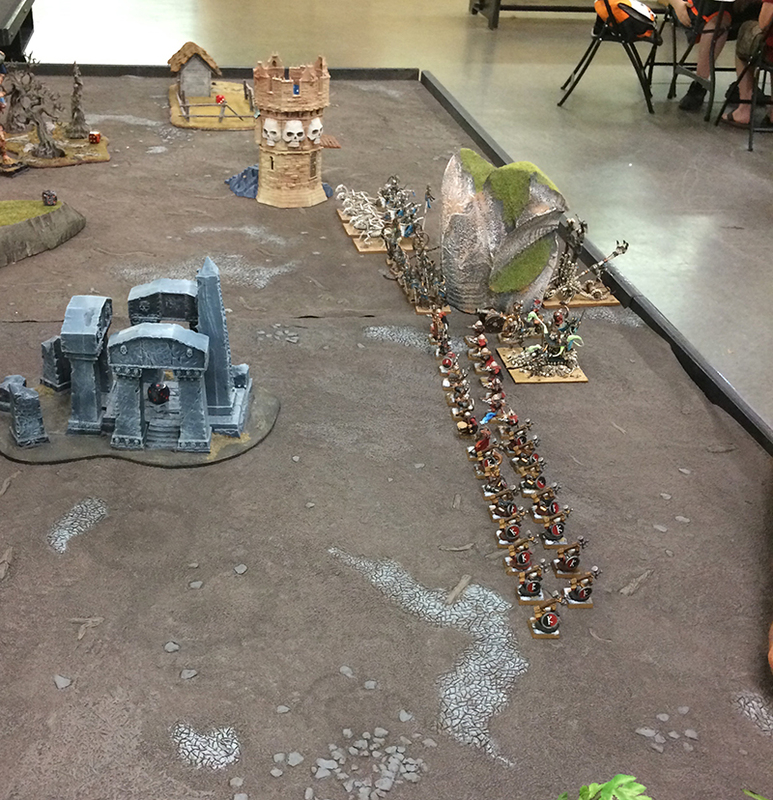 Due to the restrictions my list consisted of 10 Tomb Guard with halberds, three Chariots, a Screaming Skull Catapult, a Casket of Souls, a Tomb King and a Liche Priest. 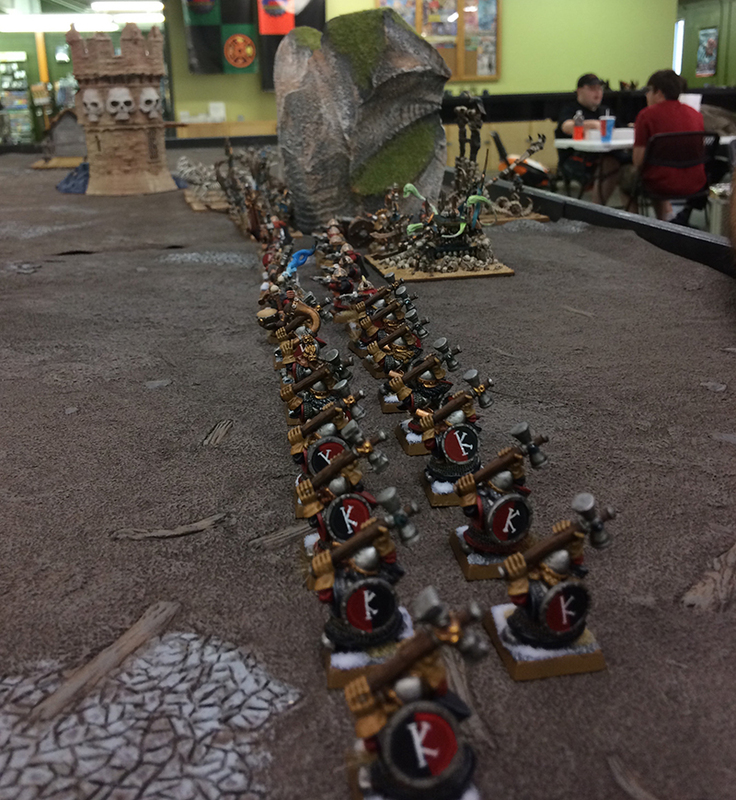 My friend had 20 crossbows, 20 Hammerers, a Rune Priest, Grim Burloksson, and a Cannon. The opposing team consisted of 10 - 15 Savage Orcs (I can't recall the exact number), a Savage Orc Warboss, an Arachnarok, a Shaman, a giant, Malogar the Dark Omen, about six Minotaurs, a Doombull, and a Cygor. I won't go into a blow by blow, but the gameplay was fairly swift. I really liked the structure of the new phases, the Hero Phase being a particular favorite. This is where you get to use your command abilities and cast spells. The first thing I did right away was summon a unit of Spearmen. I rolled high enough thanks to the spell boosting abilities of my Casket and got 20 of them instead of 10. You are not allowed to move the same turn you are summoned, but you can do everything else. So I placed them right in front of the Giant and promptly charged it. They managed to bring it down to only about two wounds, and he was finished off the next turn when my chariots charged in. I have heard a lot of complaining about summoning, and there is no doubt it can be abused. That being said though, I didn't manage to get off another summoning spell that game before my Priest died due to rolling to low. In the end the summoning may have hurt me more then helped, which I will get to later, but it was still a lot of fun. 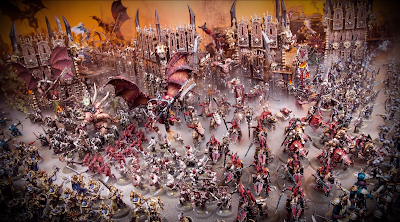 Use the only painted models restrictions and I don't think you will have nearly as much of a problem with how many units are summoned. The battle lines prepare themselves. 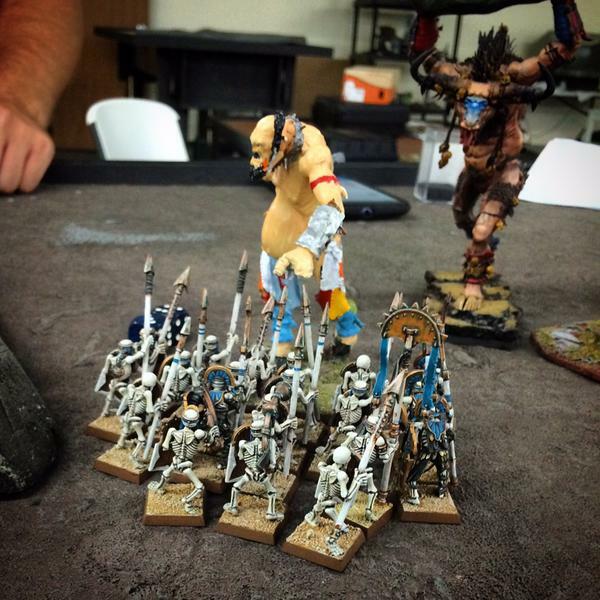 Another stand out moment for me was my Tomb King dueling both the Warboss and the Doombull at the same time. While he didn't kill either in the end, he whittled them both down to really low wounds and held his own for a few rounds of combat thanks to his 4+ re-rollable save (due to his shield). I was really hoping the Warboss would kill him since he only had one wound left himself and the Tomb King's Curse inflicts D3 mortal wounds on whoever kills him, but the Doombull took the glory instead and survived the wounds. The whole affair was very cinematic and was actually right in the center of the board too. It was definitely the stand out combat for the few rounds it went on. A new mechanic to this game is rolling for initiative each turn to see who gets to go first. This can drastically shift the fortunes of war since getting to go twice in a row can be a huge boost. At the same time if your opponent goes twice in a row it can hurt you a lot. In the end it about balanced out since we both had our chances. A fun mechanic we came up with since we had two teams of two was to have each member of a team roll a dice and then add that together for your initiative roll. This provided a lot of fun and very tense moments when you see that the opposing team's combined roll is a ten and you just rolled a five. Everyone was on the edge of their seat waiting to see what the last dice roll would be. I highly recommend doing this if your are doing teams since it was one of the highlights of the game. In the end we called the game around turn five due to time and diminishing models (all I had left was my Casket and the Catapult) and we ended up losing. 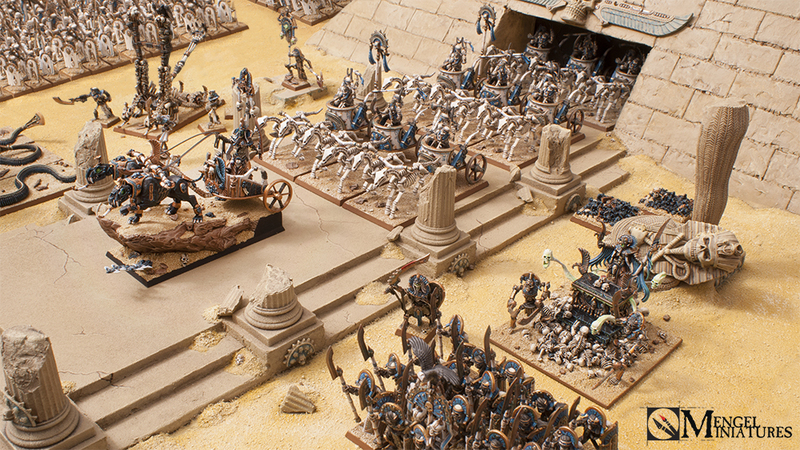 Since if their are still models on the table when the game ends you determine the winner by percentage of your army killed. Summoned models don't count towards your starting number, but do count towards your amount killed. Due to that I ended up with something along the ways of 120% of my force killed, when I averaged it out with my teammate's we ended up with a 94% while our opponents had an 75%. It was a really close game and at no point did I feel like either side had an unfair advantage. Here are a few key things I took away from my first game. Buffs from spells and command abilities are a really important mechanic and add a lot of tactical thought since I had to decide which unit was going to benefit from My Will Be Done each turn. Spells and summoning in general are not as huge of a factor as people are making them out to be. Most wizards can only cast one spell a turn anyway, so unless you have a bunch of wizards they most likely won't be the deciding factor in the game. 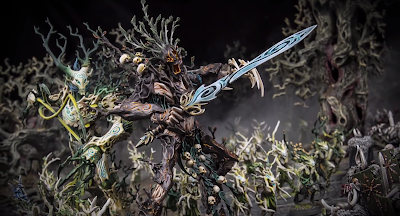 Mortal wounds and Rend are HUGE in Age of Sigmar. They can turn the tide of a combat very quickly. The same goes for multiple damage attacks. The Minotaurs each had damage two attacks, so each wound that got through took out two of my guys. They pretty much plowed through my Spearmen and Tomb Guard. You will have to reevaluate the worth of some of your units. Just because something was an auto take in 8th does not mean it is the same now. My Casket didn't do much all game. A lot of that was due to poor rolling on my part, but with only one attack, that's all it takes to hinder the unit. In the future I might take something different or look at ways I can buff that unit with other units in my army, such as a priest. Synergy is the MOST IMPORTANT thing to consider now when building your list. With all of the special abilities most units have you really need to look at how they interact across your army. Choosing the order of combats is another huge addition and really requires a lot of thought since a poor choice can end up with a unit getting annihilated before they et to swing back. Most of all though, the main thing I took away was that this game was a lot of fun. There was still a lot of tactical thought that had to go into every turn, but it flowed faster. It's different from 8th edition, there is no doubt, but I do not think it's worse. It's its own beast and needs to be approached as such. 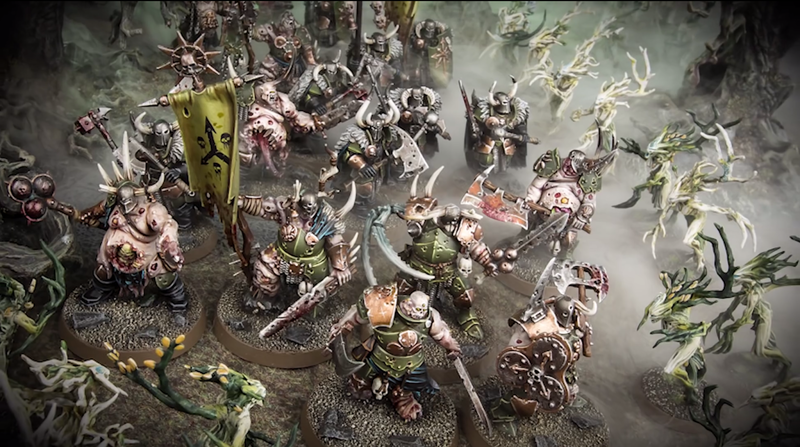 If you go into a game of Age of Sigmar and just keep complaining about it, or about how it's different from what 8th was, you probably won't have fun, and your opponent might not either. At no point did our game devolve into one massive combat in the center of the table. 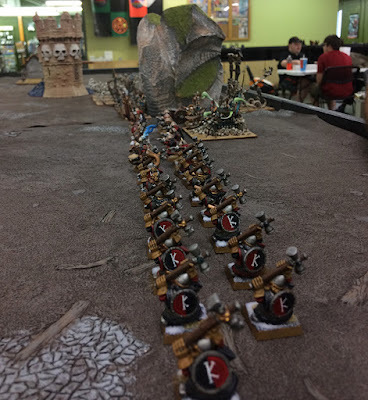 The Duardin mostly hung back and lured the Orruks into their guns while I swung half my force around to the right side to try and flank the Beastmen. 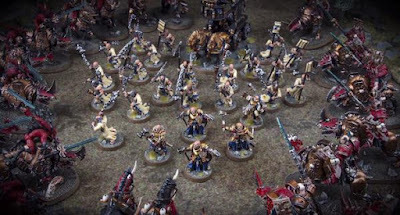 I think we all had a lot of fun playing the game and one of our opponents even mentioned that it felt a lot more cinematic to him and that he really enjoyed the freedom he had with his Orruks as they were able to react to threats around the table in a faster, more believable manner. I could keep going on about all the different aspects of Age of Sigmar that I found enjoyable but this is already much longer then I was planning. I think Games Workshop really hit this one out of the park. The number one fear and complaint I have seen online is the lack of balance. Thanks to about five minutes of discussion amongst us with how we wanted to approach army selection for our game we had no issues at all. If you can't spare five minutes to work out a fair approach before a game, then maybe you should find a different game to play. I have seen more bile and rage spewed online about this game then I have seen for anything GW has put out. My recommendation is ignore it. Grab your army and trying playing a game yourself. Maybe you'll hate it still, or maybe you'll love it like I did, but please do not let the trolls online color your opinion. Give it a fair shot, you may be pleasantly surprised. 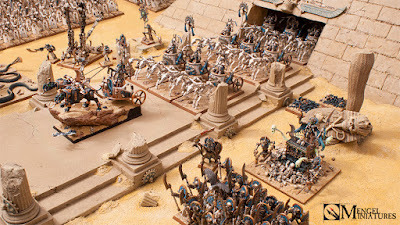 Now if you'll excuse me I need to assemble some Stormcast Eternals and plan out my Tomb King's burgeoning empire in the Desert of Bones.